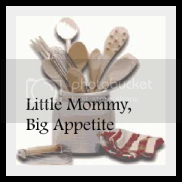 Little Mommy, Big Appetite: Apples Three Ways: Grilled Apple "Pizza", Chunky Applesauce, and Apple "Sandwiches"
Apples Three Ways: Grilled Apple "Pizza", Chunky Applesauce, and Apple "Sandwiches"
adapted from R. Sandlin in "Taste of Home"
1. Brush the pizza crust with a little bit of butter and cook on a covered grill until golden brown. 2. Meanwhile, place apples and tbsp. of butter in a saute pan and cook until apples are tender (this is where I added the splash of apple juice to avoid adding more butter). 3. When apples are softened, add cinnamon and sugar. 4. Place apple mixture on baked pizza crust. 5. Top with anything of your choice! We used raisins, caramel, and cream cheese frosting. ***I baked the crust in a pie pan in the oven due to the never-ending rain we're experiencing and it worked well - but it would be fun to do this on the grill! adapted from D. Amrine in "Taste of Home"
1. Cook apples with cinnamon and sugar in a covered dutch oven until tender. Stir occasionally. 2. Mash with a fork and add vanilla. *This would make a great topping to a pork dish, or on ice cream. By: Crystal at "Mrs. Happy Homemaker"
to see the ingredients for this adorable recipe! 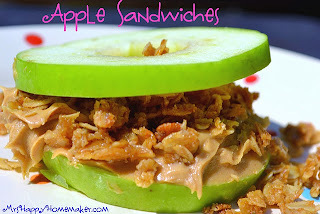 It's a must try for apple and peanut butter lovers! What wonderful apple recipes. I love cooking with apples and keep looking for new ideas. I have never made a pizza with apples and it sounds intriguing. Apple Pizza ..now that's unique! Looks yummy ... I just started a Food Photo linkup this morning - please add one of your fabulous shots! Thanks! Love apples too, and those 3 recipes each look great, especially like the apple sandwiches!! Yum! I'm definitely making this! Apple pizza is such a fun idea! I will have to try this as a weekend breakfast treat. Happy Foodied Friday! These are great recipes for all the wonderful apples we have this time of the year. I am going to try the Grilled Apple Pizza, it looks so good. 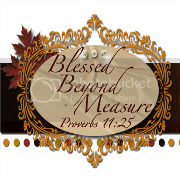 Hope you are having a great week and thanks for sharing with Full Plate Thursday.